How do I get people to come to my website? How to increase traffic to my website? How to get my website on Google and Bing? Why isn’t anyone coming to my website!? You would be surprised to know that millions of website owners ask these questions to themselves each day. In this article, I’ll explain some no-nos to designing a great website and ways to increase your website viewers. So your website is up and running, you’re happy with the design, all your links are working, load times are great. So why is it that your visitors are running away in droves and why isn’t any coming to your website? The answer may lie in these few mistakes, regularly made by web designers and people who design their own websites. 1. Auto-playing music or videos. People don’t want autoplay functionality. They want to be in control of what they experience. Also, this can lead to slow page load, as not all people have fast internet speeds. Some people may be in a library or other place that requires you to be as quiet as possible and having a video or music that auto-plays may be inconvenient to the viewer. Those annoying ads that pop up, just when you’re in the middle of reading an interesting article, or you’re browsing a product, and it will only close when you have either entered your email or you manage to find the really small close button. If you really need to have a popup, make sure it opens up at a common sense time. Simple web design is best. Less is more. When designing your website, write down on a piece of paper, what you main headings are going to be. Use diagrams as well. Then try to minimize the number of headings and subheadings as much as you can. 4. Your website is not mobile responsive. Mobile responsive web design is one of the key factors in creating a website that attracts customers and viewers. Research indicates the nearly 60% of users browse the Internet on-line. If your website is not mobile responsive you could be missing out on potential revenue and viewers. Not to mention your businesses first impressions and reputation. A professional website designed for users will make them happy and a happy viewer/customer is great for a businesses impression. Videos, images, text, all of it is content. Outdated content is one of the biggest deterrents for website viewers. Make sure your prices, demos, videos, and written content is up to date and is correctly written for SEO ( Search engine optimization). You can have old content such as blogs and other written content, but make sure that it is relevant to today’s trends or standards. A slow loading website is both annoying and unprofessional. Slow loading websites can lead to user frustration and dissatisfaction. How many times have you been to a website that takes ages to load and then go to another website out of frustration? A good load time is about 1.5 – 2.5 seconds on a fast Internet connection. The quicker the better. If you have a lot of images you can use an image compression utility known as TinyJPG, it compresses your images to a smaller size. 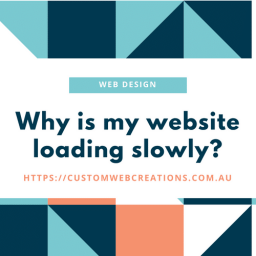 You can read my other article on causes of slow loading times and ways to increase the loading times of your website. 7. No Social Media links. People like to know more about your company. They like to know that they can trust you and your company. Also, social media users account for 20% of all online leads and viewers to a website. There is nothing worse than a boring, unprofessional website. A clean cut, good looking website is best. Good web design is having a website that looks great but doesn’t bounce around too much. You could have a few fancy features to your website, but don’t overdo it. Your text content should be split up between images, and videos, and the more text content you have the better. Google ranks websites higher, the longer you keep a user engaged. 9. Ensure that you are providing the service, subject or product for what they searched for. Overwhelming your potential customers and viewers with too much-written content is a big fail when it comes to website design. But not having enough is also a trait of bad website design. Depending on the page you are writing content on depends on how much information you should have. If you have a blog, then the more content the better, at least 500 words for each blog post should be sufficient. Try splitting up the content with images or videos. This helps to alleviate eye strain and minimize readers getting bored and moving on to another website. If you are writing content on an About Us page or a Services page then keep the written content to about 5 decent paragraphs. If you are required to write a lot of text content on a web page make sure your split it up with plenty of images, infographics, and videos, this minimises the eye strain and the spaces up the reading sections. Trying to find the right mix of design that helps convert and also looks good can be a struggle. There is no point in having a website if it doesn’t convert. So you have to find a medium where your website looks good but also has all the functionality of user interaction, such as CTA’s (Call to action Buttons and links), online contact forms, social media buttons and contact information clearly displayed. An easy to navigate, professional, clear-cut design is the ongoing website design trend these days, with information that is clearly organized with headings and subheadings, bullet points and numbering is a must. A consistent well design website is not only appealing but also easy to navigate. A visitor the comes to your website finds that a uniform website is well organized and this can give them a good first impression. Look at your headings and navigation on each page. The navigation should have no more than 5 main headings or pages (you can place subheadings or links under each main heading) for small businesses and no more than 10 for larger businesses. 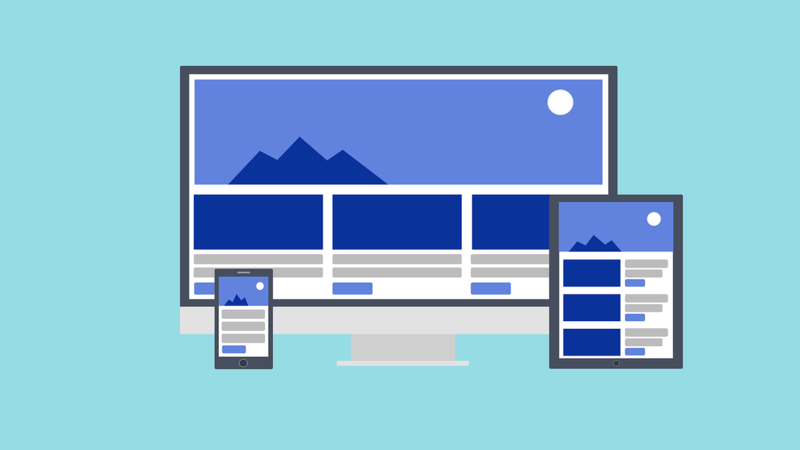 The headings on each page should all be visually the same, apart from the text of course, but if you have an image slider on the home page, try to add have an image heading on each of your pages. The footer should also be consistent across your entire website, with navigation to the main pages in your website, contact information, and social media links. So the header and the footer should remain consistent, its the main content, or the content in the middle that can vary. Are all the links on my website the same color? Are all the buttons the same format or color? Are all the main navigation links the same on each page? Is the footer the same on every page? Are all the headings and subheadings consistent? When visitors come to your website, they want to know that your business is reputable and legitimate. Doesn’t that feel like as if they are a dodgy business, and most likely you won’t pay for there product or service online? Make sure when you get your website designed by a web designer that they have these pages included as standard in their web design packages. It can be very tempting to buy stock images from an online photography website, but these can actually deter some viewers, especially if they have seen these images on other websites. They can make your website look unoriginal and boring, so taking your own images is a plus. Images taken on a mobile phone are of high quality, make sure that they are not blurry and capture what you want the image to put across to the viewer. After all, a picture can mean a thousand words. Pixelated or low-resolution images are unsightly and unprofessional. If you have large images that are of a large size then use paint to make them smaller and also use an image compressor that will compress your images without losing quality. When you write content, whether it’s on your blog or your “About Us” page or Services page make sure you have a mix of what your company does and also what you can offer the client or reader. Just writing about what your company does might give the impression that you are mainly concerned with your company and not with what your customer wants. Visitors want to know whats in it for them. They don’t want to hear about all about self-praise, telling them how good your business is great, but also back it up with testimonials, case studies about a project where you helped your client meets their goals, and other fact-based content. 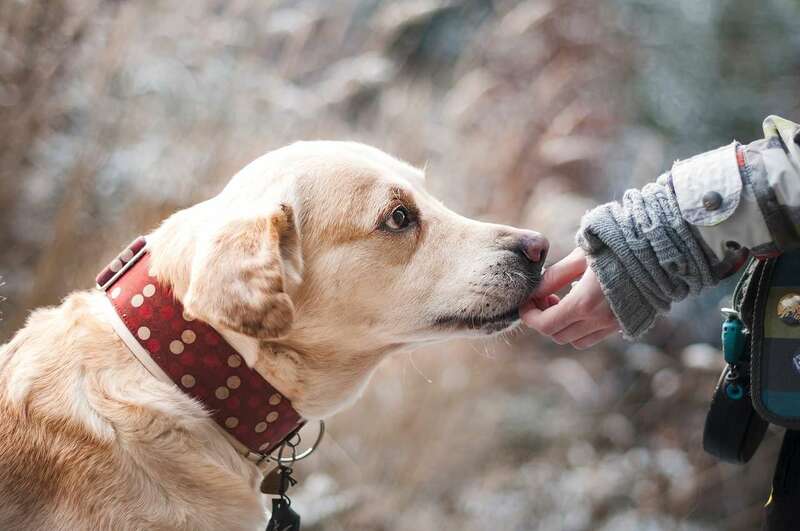 Explain how you had a client with a problem and how you help solve their problem and how you went the extra mile to make them into a happy customer, not just a satisfied customer. Having no CTA’s or online contact forms is one of the biggest mistakes in website design you can make. If a customer doesn’t see a CTA or a button with “Buy Now” or “Contact Us” then how do they interact with your website? They read your companies information, then nothing! These CTS’s help to guide the user in making a decision and an online form is an easy way to gather emails and potential leads. Don’t leave your visitors at a dead end. When they scan your page, add a link or button such as “Read More” or a link that has a descriptive title as to where the link will lead to. All good web design businesses will incorporate this element into your website when the design it. Have all your pages linked so they roll onto to the next one, try to keep the viewer on your website for as long as possible. This helps with Google rankings as it tells Google that your website is interesting and relevant to what the user searched for and Google will increase your rankings on its search engine, and that means more potential customers and viewers. These are the most common mistakes web designers make when designing a website and if you are adding content to the website after the website has been designed as well. 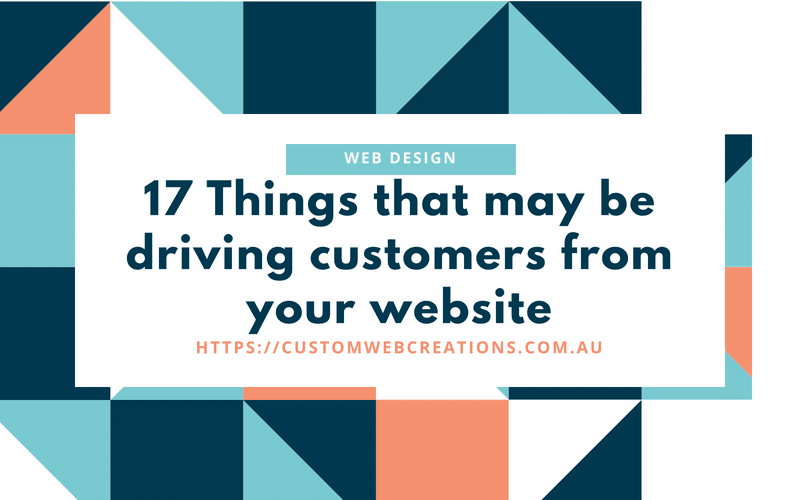 They are the most common reasons that may be driving people from your website and should be avoided at all costs. SEO (Search Engine Optimisation) is the process of making your website searchable in search engines using programming code, keywords in content writing when you add text content to your website and a multitude of other optimization techniques. The reason I mention SEO is that it plays an important role in any websites’ exposure online. Blogs are a key factor in getting your website to come up in search results. Regular posting, at least once a week, with at least 300 words for each post. When writing text content use keywords. Don’t overcrowd your content with keywords though; use 2-3 keywords per paragraph. A great online keyword generator can be found here, you can also read more about content writing here. Google uses keywords to get an idea of what your website is about and also uses them to bring your website up in search results. So if you had an online shoe store you would type “shoe store”, “online shoe store”, “high heel shoes”, “affordable” and so on and so on into the above keyword generator. Other keyword phrases can be search terms that you would use yourself to search for services or products in Google and Bing. Think of a phrase that you would use to get to your website, or think of words that describe your business’s products or services. Another way to get people to your website is by posting your links on social media mediums such as Facebook, Twitter, and Pinterest. Link your blog, post your website links to as many groups as possible. Advertising, such as Google Adwords and Bing Ads are a great way to get immediate results, while the ones I’ve previously mentioned and the ones below take some time to drive traffic to your website. Google and Bing ads have a slight learning curve and can be expensive if you don’t have the right strategies or target market, so it might best to call them for advice or hire a professional marketing guru. They also offer free credit to get you started. There is also Facebook and social media marketing and advertising. And this can be great for small businesses or start-ups. Social media can be good for beginning a business, then you expand with a website, although getting a website up as soon as possible is also good. Google + is a great way to increase your businesses exposure, it is used by millions of people to start there own campaigns and network with other businesses online. Check it out, it has a slight learning experience but once you get the hang of it, its easy as pie. You can also try Google business. Google Business is what I have used since the conception of my business. It cannot be understated as to how much this platform can expose your business online. It is one of the best ways to get your business to show up in the Google search engine when people search for your business online. When you search for something on Google, Google business are those sections on the left-hand side or in the search results that have a business that is most relevant to the search term used. The below screenshot is one of my business coming up in a search result, and its also on the first page of Google, so I have hundreds if not thousands of people seeing my business. This is proof that it actually works! When I type in the search term “Custom web design Brisbane” my Google business listing shows up. The search term used is a common and a highly competitive keyword for my industry, and the web design industry is extremely competitive. My business also shows up on Google maps when people are using Google maps, so that is another bonus. It took me around 6 months to get it on the first page of Google, but once it was there, it feels great, considering there are over a million users using Google in my area alone! And it doesn’t cost me a cent, that’s right, its free! Now you might be thinking, how do I get my business on there? It’s easy just go to Google Business and sign up. Add your business and follow the instructions. But don’t expect your business to show up on the first page straight away, it takes some time. The best way I have found to get it on the first page of Google was to get people to add reviews on your Google business listing. Try to get as many people as you can adding reviews on there, all they have to do is click on the “add a review” button. Also when adding information to your business, use keywords, as I have explained above. Above all be patient, it all takes time. Create great blogs with great content on your website, people will naturally create links to your blog on their website. Submit to web directories such as Craigslist, Gumtree, Locanto, Yellow Pages, True Local and many more. Share your articles from your blog to social media as much as you can. YouTube is one of the largest search engines on the web. Create a YouTube channel with great videos and a good description with keywords. Ask visitors, peers, friends, and family to share a link to your blog or website on their social media accounts and wherever possible. Quora is a question and answer website where you can ask questions as well as answer them. If you give a good answer to a question in your niche with a backlink to your website, it can be a valuable source of traffic. LinkedIn is a great business profile platform where you can add your resume, business information, post articles and much more, it is one of the most widely used business social media platforms on the internet today with millions of users. Posting content gives you an opportunity to add backlinks and links to your blog or website. The above are a few ways to get traffic to your website, some take time to happen, while others can be immediate, but following the above suggestions is a great way to start. Of course, your website must be indexed by Google and Bing to start with. You can find out whether your website is indexed by Google by typing in site:yourdomainname.com into the Google search bar, if it doesn’t show up it is not indexed and cannot be found. You must make sure that it is indexed first. Why is my website loading slowly? What are domains and hosting? Why should my website be mobile responsive? Im Timothy Allsworth, and I love building businesses up and increasing their website traffic, send me an email and I'll generate more traffic for your website. Custom Web Creations Web Design and Web Designer Brisbane shared a link. Custom Web Creations Web Design and Web Designer Brisbane shared a post. How do I make a website? 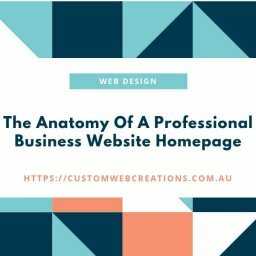 I need an affordable web design business that won't break the bank. How do I get my business on Google? How much does it cost to build a website? Business Reviews. Why are business reviews important? How to get business reviews. In this article, I explain why they are an important part of any businesses marketing campaign and how they affect SEO.